The Technology in Healthcare Interview with Phil Crompton originally appeared on the Parkin Architects Limited blog. Vantage is working with Agnew Peckham and Parkin on a Healthcare Master Plan for the Children’s Hospital of Eastern Ontario (CHEO) in Ottawa, Canada. This is part one of a two part series – read the the second part of the interview. 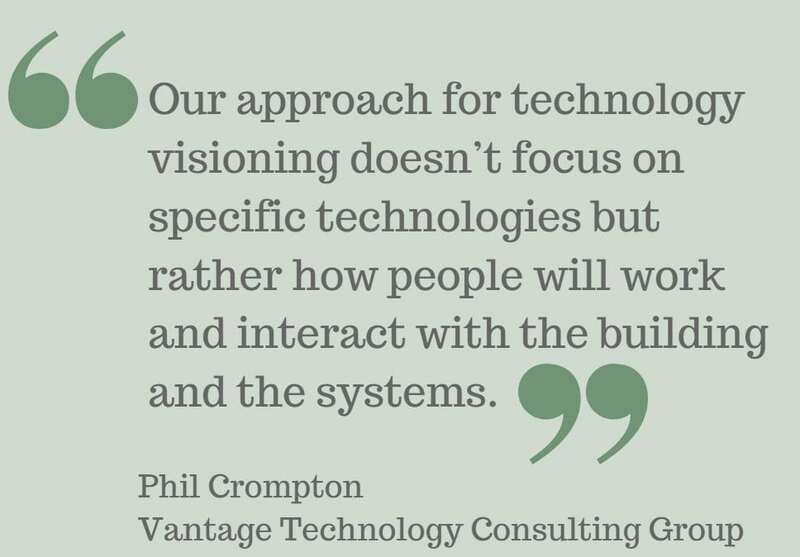 Phil Crompton, founder and principal at Vantage Technology Consulting Group, is known for his visionary view of technology. He helps organizations envision the role that technology will play in their future, and guides them through the complex process of building effective and resilient technology systems and infrastructure. Q1. How did you get started in strategic technology planning? When I was midway through my electrical engineering degree in England, I spent a year working at a company called Arup, a global multidisciplinary building engineering firm. When I showed up, they weren’t quite sure where to put me, so they put me in a brand-new group they just started which, back then, was known as Telecommunications. At that time, the City of London was converting from paper-based records to electronic records and I was dropped in the middle of those projects. I basically had a vertical learning curve on all kinds of different technologies. From that point, I was absolutely hooked. It was definitely the thing I wanted to make a career out of. Technology impacts various market sectors at different times in their life spans. Now we are experiencing the same thing in healthcare with the move from paper-based records to electronic records. It’s interesting how technology happens in cycles and waves, and how it impacts various market sectors at different times in their life spans. So, from a strategic planning perspective, that’s one of the benefits Vantage brings, as we can see a particular technology or application hasn’t been deployed in one market sector, but that another market may have been using it for the last 5, 10 or even 20 years. You can bring something which seems new and exciting but has been proven elsewhere in another industry. Q2. What market sectors do you focus on? At Vantage, we provide services for the healthcare, education, public and corporate market sectors but I gravitate mainly to healthcare projects. I like the fact that we can make a big difference. It may sound trite to say that we save people’s lives, but I believe that indirectly the work we are doing in hospitals and healthcare facilities does just that. We can improve patient safety, empower family members, and enhance the environment for the doctors and nurses so that they can focus much more readily on providing healthcare. Q3. What is the strategic technology planning process for a typical healthcare project? We always want to be involved in the initial planning stages of a project since technology has a significant impact on the performance of the building, the way staff work within various spaces, and the interaction between the various stakeholders who work in and visit the facility. The challenge is that it can take quite a while, from the initial designs to the end of construction, for a hospital to be built. In California it may take nine, 10 or even 11 years. While it seems a bit faster in Canada, if you pick your technologies at the beginning of the process you are pretty much guaranteed to have obsolete technology by the time the building opens to the public, so, there is this conflict between talking about technology at the very early stages of a project while still trying to postpone any technology decisions until later. For this reason, our approach for technology visioning doesn’t focus on specific technologies but rather how people will work and interact with the building and the systems. The focus is on the experience, not the technology. The focus of visioning is on the experience, not the technology. We have a well-defined process that steps interdisciplinary teams through a number of visioning sessions based on day-in-the-life scenarios. The interdisciplinary teams are typically stakeholders from different components of the organization, i.e., doctors, nurses, clinical and the ancillary staff who support the healthcare professionals, people who can represent the patient and family member experience, and other support staff, like IT, security and facilities. The outcome is a vision document which talks about the way people will interact and engage with the building and the technology that may go into it. For instance, what is the perfect scenario for a patient visiting the emergency department? From how they get to the hospital to what happens when they travel all the way through triage, observation, treatment, discharge and all the way back out again. What is that process and how can technology improve it? The goal is to get the teams to talk about how they do it now, their challenges, how the process could be improved, and what would be the perfect process. We try to avoid talking about particular technologies at this point. If someone says I would really like an iPhone, we would say, “Let’s just talk about having a mobile device. What does that mobile device do?”, because we know these technologies will change. The goal is to get the teams to talk about how they do it now…and what would be the perfect process. Out of those day-in-the-life scenarios, we create use-cases for particular applications that ring true across all of the day-in-the-life scenarios. For example, you might run the groups through five or six day-in-the-life scenarios for a patient, you might do a family member visiting a loved one, a nurse caring for multiple patients, or the transportation personnel who, while often unseen, are one of the critical components in a healthcare facility. When you pull all of this together you start to see common factors, and that’s where we can start to develop the technology use-cases where we can drill down and start to see the technologies that can support the various needs. Technology for technology’s sake doesn’t make sense. A lot of great ideas come out of these visioning sessions, but we’re always keenly aware that technology for technology’s sake doesn’t make sense. We want to talk about technologies that provide clear, quantifiable value, and it doesn’t always have to be in dollars so, as a part of this visioning work, the technology system outcomes are all tied together with a rough order-of- magnitude budget, and a last responsible moment schedule–not the last possible moment but the last responsible moment, which is a big difference–so that the hospital can understand how much everything is going to cost, when we need to make a decision, and the impact of that decision on the building and its infrastructure. Basically, what we are trying to do is postpone a decision about choosing a particular technology until that last responsible moment. For systems which have a big impact in the building, the last responsible moment for picking that technology is prior to the building design. For things like a flat panel display that will hang on a wall, the actual product selection is much further down the line, say six to 12 months before the hospital itself opens. We are trying to postpone a decision about choosing a particular technology until the last responsible moment. This is part one of a two part series – read the the second part of the interview.